Audio Video to AMR Converter is a professional and powerful utility to convert Audio to AMR and AMR to other audio formats such as MP3, WMA, WAV, M4A, MP2, AC3, AAC, etc. In addition, you can also use the program to extract audio from AVI, MP4, WMV, 3GP, MOV, VOB, MPG, ASF, RM, RMVB, FLV files. 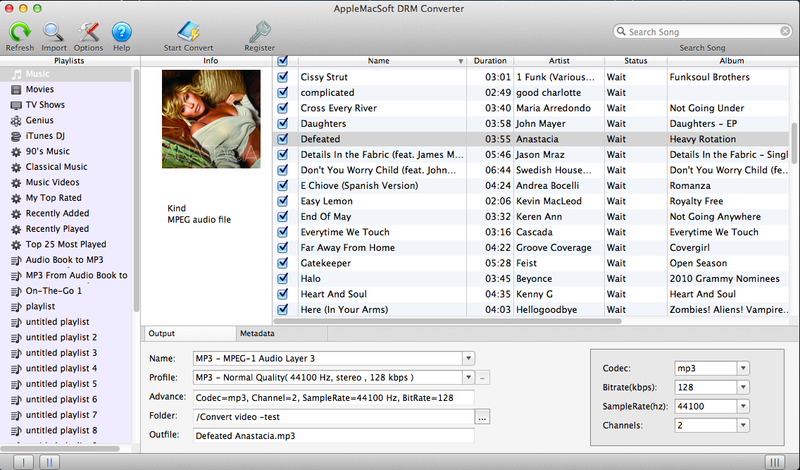 Audio Video to AMR Converter performs in batch mode so that t you can easily convert an entire list of audio files to AMR with very little effort. It lets you trim any segment of your video/audio files by setting the start time and end time. 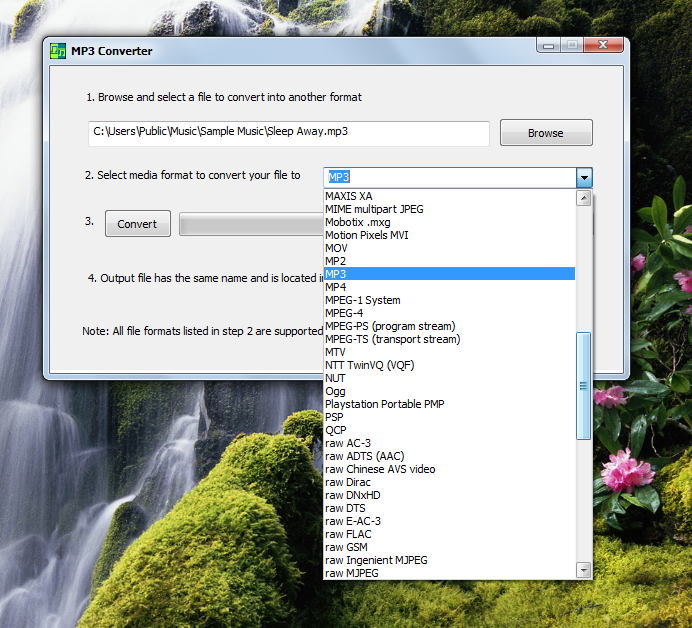 Audio Video to AMR Converter provides you with the optimized default settings. However, there are still a lot of settings can be tweaked to fit your special need such as sample rate, bit rate, audio encoder, channel, and volume. Audio Video to AMR Converter is designed for anyone who wants to convert mp3 to amr, wav to amr, amr to wav, 3gp to amr, amr to wma, amr to aac, etc. A professional audiobook DRM remover, ThunderSoft Audiobook Converter for Mac convert audiobooks to unprotected MP3, AAC, M4B, M4A, WAV, FLAC and other popular audio format. Easy to use, fast convert speed, and no quality lost, just import audiobooks and convert, this software help you get rid of drm, and enjoy your audiobooks on any media player such as iPod, PSP, Zune, mobile phones, etc. With ThunderSoft Audiobook Converter for Windows, you can convert audiobooks to unprotected MP3, AAC, M4B, M4A, WAV, FLAC and other popular audio format, which you can play with other audio players, such as iPod, PSP, Zune, and mobile phones. Convert iTunes DRM protection audio and audiobooks to MP3 or other formats at up to 16x speed on your Windows. easily strip DRM media files of any unwanted protection so your purchased music and audiobooks can be played on any device you like! Further more, you can also extract audio files from iTunes videos with no quality loss on your Windows. Convert all audio files at unbeatable fast speed and support batch conversion. Convert more than thirty video or audio formats to mp3. Including wma, wmv, flv, mp4 and wave. Convert to mp3 because it is a highly portable audio format. After the conversion process, one will not notice any changes in the quality of sound involved. Want to convert your FLV videos into your mobile phone? Forewave FLV to 3GP Converter is the right tool for you! With this fast conversion engine, it enables you convert FLV videos to 3GP2 super-easily. Forewave FLV to 3GP Converter supports both FLV and SWF as input format and supports 3GP and 3GP-2 as output format. You can customize the output quality, output resolutions by modifying the output options. Forewave Audio Converter is an universal audio converter, it provides you an easy way to convert between different audio formats including MP3, WMA, WAV, Real Media RA, FLAC, AAC, AC3, AMR, WAV etc. It also supports Video-to-Audio conversion, you can import a video file in almost any popular formats and turn it into an audio file. Supported input format: AVI, DivX, Xvid, MPEG, WMA, MP4, H.263, H.264, MPEG4, MKV, MOV, RM, 3GPP, 3GPP2, VOB, SWF, FLV etc. Supported output format: MP3, WMA, RA, FLAC, AC3, AMR and WAV. Forewave Video Converter has a comprehensive support of video formats, which including AVI, DivX, Xvid, MPEG, WMA, MP4, H.263, H.264, MPEG4, MKV, MOV, RM, 3GPP, 3GPP2, VOB and even the Flash SWF and FLV format! It also has a great support for those popular audio format, like MP3, WMA, WAV, RA, AAC, AC3, AMR etc. Easy Audio Converter for Mac lets you quickly and simply batch converting video and audio to various audio formats. The batch conversion mode helps to make the music conversion faster and more efficient. The app provides full iTunes integration and lets you edit the album, artist and track information. supports many video and audio file types including AVI, MPEG, WMV, MOV, MP4, FLV, SWF, MKV, WMV, RM, RMVB, ASF, TS, MTS, 3GP, M4V, OGM, NSV, VOB, MP3, WMA, WAV, AAC, FLAC, OGG, APE, M4A, AC3, AMR, DSD and among many others. Audio Video To WMA Converter is an easy-to-use tool to convert many formats of audio and video files to a wma file. With the build-in multimedia player, you can preview the media file, set the start time and the end time, convert any audio section of the file to high quality WMA file. The main features include: Extract MPEG to WMA, AVI to WMA, VCD to WMA, WMV to WMA, ASF to WMA, DAT to WMA, MPA to WMA, MPE to WMA etc. Convert WAV to WMA, MP3 to WMA, MP2 to WMA, AU to WMA, AIF/AIFF/AIFC to WMA, SND to WMA etc. If extra codecs are installed, the program can convert DIVX to WMA, AC3 to WMA, OGG to WMA, MKV to WMA, OGM to WMA, MKA to WMA, SVCD to WMA, etc. Split WMA file into smaller piece. Preview audio and video. Fast encode WMA file with different encoding bitrate so that the audio quality and file size can be adjusted to meet your requirements. The bitrate is bigger, the file size is bigger, the audio quality is higher, and vice versa. Support multilanguages as possible as it can.